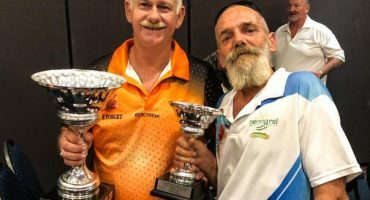 Keeping fit, healthy and getting involved in sporting events across the community is one way Nerang RSL and Memorial Club Sub Branch member, Sean De Gelder, now likes to spend his days. 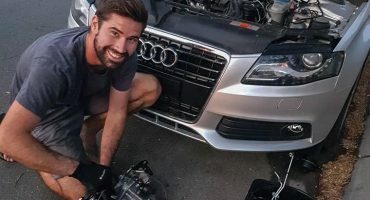 Often waking up at the crack of dawn to tackle his fitness goals, Sean has become involved in numerous triathlons, bike rides, and swimming carnivals and we’re delighted to profile the ex-serviceman, who is using his experiences to positively influence and encourage fellow veterans, in this edition of The Stentorian. A veteran of International Force East Timor (INTERFET) and serving in 1999, 2006 and 2010, Sean was part of the multinational force which was formed to address the declining security and humanitarian state in East Timor. Following his time in the Defence Force, Sean began to experience the challenging effects of post-traumatic stress disorder (PTSD) and was introduced to the Veteran Health Association (VHA) which he says assisted him greatly, and introduced him to the Sub Branch at Nerang RSL. “I’m very thankful for the support I’ve received from the VHA and the gents at the Sub Branch and from the RSL itself, it has definitely made an impact on my life for the better,” said Sean. “I know how exercise can assist with emotional health and I wanted to get into fitness so after speaking with the Sub Branch, they went out of their way to help me achieve that. 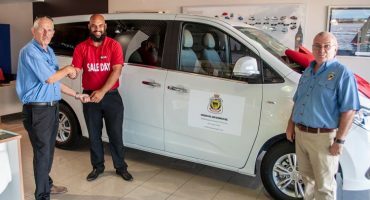 I was keen to get involved in events like triathlons and before I knew it, the Sub Branch guys were going into sporting stores and speaking with other triathletes to put me in touch with the right people. 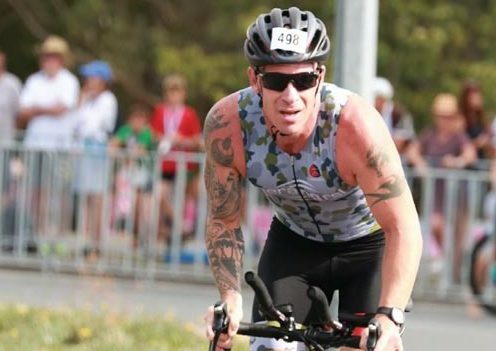 On the back of a sponsorship from the Nerang RSL, Sean kicked off 2019 competing in the Queensland Triathlon Series. He pushed through a grueling 1.5km swim, 40km bike ride and a 10km run to claim a very commended 6th place! “Sporting events can be quite expensive to compete in so I’m extremely thankful to the Nerang RSL for sponsoring my involvement in the Queensland Triathlon Series. I was able to purchase a bike and a custom made competition suit with the Club’s logo on it – that I wore with great pride,” said Sean. “I did quite a bit of swimming and bike riding to prepare for the event and I’m generally happy with placing 6th in the Olympic distance category. Being my first Olympic distance triathlon, I was honestly just happy I was able to finish the event,” he laughed. 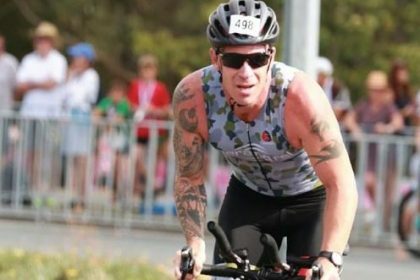 As part of his involvement in the Queensland Triathlon Series, Sean also represented PTSD Resurrected which runs a Reboot Combat Recovery course providing help for service members, first responders and their families. Since graduating from the course alongside his wife, Leanne, Sean has become a mentor for Reboot and says the course has helped him manage the effects of PTSD and anxiety. “The Reboot course, in addition to my own spiritual healing and church community, has helped me very much in the challenges I’ve faced with PTSD and anxiety,” said Sean. “I completed the Reboot course at the start of 2018 and it was an experience that helped both Leanne and myself understand PTSD and anxiety, and ultimately what we were going through. Since becoming involved and receiving support from organisations and groups across the local community, Sean has referred a number of fellow veterans to these groups and says through also focusing on activities he enjoys, such as triathlons, he hopes to encourage others to step into something they enjoy. “For me, competing in events like triathlons gives me something to focus on and look forward to. I enjoy putting my energy into setting fitness goals and training to achieve them, and it helps me maintain a healthy diet along the way too,” said Sean. “I hope to compete in a few more triathlons this year, but I’m currently preparing for a swimming carnival in February and another in March as part of the Australian Imperial Forces. 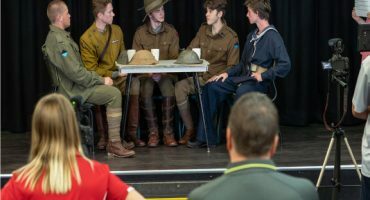 The carnival will be held in Melbourne and was originally formed for wounded veterans that returned from WW1 to help with their rehabilitation. All RSLs across Australia can get involved and it’s a great day and a fantastic opportunity to meet fellow veterans. “I’ve found something I really enjoy doing and hope to encourage fellow veterans to do the same, whether it’s a new activity you might be interested in or a hobby you did previously that you enjoyed. 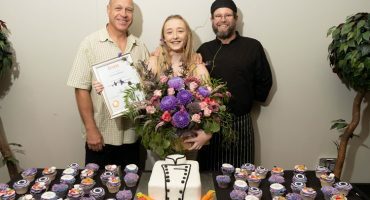 Meet Anastasia, the first to complete commercial cookery apprenticeship!